Story: A penitentiary full of felons has inspired the jailers to create a grisly pastime ripe for lucrative kickbacks. 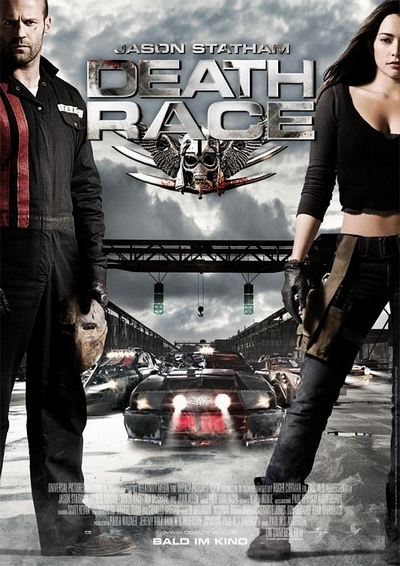 Now, adrenalized inmates, a global audience hungry for televised violence and a spectacular arena come together to form the Death Race. Three-time speedway champion Jensen Ames is an expert at survival in the harsh landscape that has become our country. Just as he thinks he has turned his life around, the ex-con is framed for a gruesome murder he didn't commit. Forced to don the mask of the mythical driver Frankenstein-a crowd favorite who seems impossible to kill-Ames is given an easy choice by Terminal Island's warden: suit up or rot away in a cell. His face hidden by a metallic mask, one convict will be put through an insane three-day challenge. Ames must survive a gauntlet of the most vicious criminals in the country's toughest prison to claim the prize of freedom. Driving a monster car outfitted with machine guns, flamethrowers and grenade launchers, one desperate man will destroy anything in his path to win the most twisted spectator sport on Earth.